If you look at semi-mythical items in stories through the ages, you'll probably find that a lot of them are weapons. Archangel Michael wielded a flaming sword, Lugh and Cu Chulainn both used spears, Arthur used Excalibur, Luke Skywalker used his father's lightsaber... Dirty Harry threatened people with his magnum. A disproportionate number of semi-mythical weapons seem to be swords of some kind. It seems only fitting that a weapon that captures people's imaginations in the modern era would also be a sword. The Japanese katana is legendary -- not only because of the people who used it, but also because of its fabled, almost unbelievable strength and cutting power. The Japanese used a process of folding steel that produced a quality of blade rivaled only by Damascened watered steel. The cutting edge of a properly-produced katana was absolutely unrivaled in its time; even today, the edge is unbelievable given the low-tech processes that create it. It is a truly mythical weapon. The sharpness of the blade has the unfortunate side effect of seriously maiming or killing partners, which in turn discourages paired practice. In the modern era, the use of the katana has been split into two specific systems of modern martial arts: iaido, and kendo. Iaido is the practice of the use of an iaito. An iaito is a sword approximating the length, curvature, weight, and balance of a katana. However, unlike a katana, its blade is created from an aluminum-zinc alloy and is impossible to sharpen. This reduces the number of accidents considerably -- imagine how many would-be samurai found their careers cut short simply because they slipped and lopped off a few fingers when drawing or sheathing their sword! At its heart, iaido is a deceptively simple art. The nationally-sactioned form of iaido contains 12 kata, or set practice routines. These kata have been codified from many other older, traditional schools of iaido. However, these are performed without a partner, which means that the practitioner must understand the "story" behind the kata in order to move properly and demonstrate a realistic fighting spirit. It's not as simple as it sounds. Indeed, many beginning students spend weeks simply learning how to draw and return the sword smoothly. At least they don't have to worry about losing fingers in the modern day! Kendo balances iaido. While iaido teaches students to use a sword in historical situations, kendo teaches students how to use a facsimile of a sword in real situations. 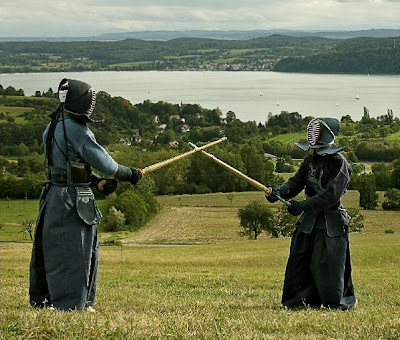 Many people dislike the idea of kendo due to the fact that a lot of techniques simply would not work well with a sword; indeed, they're correct. The "sword" used in kendo is a long rod made from four thin bamboo slats and is called a shinai. Unlike an iaito, it is neither shaped nor sized like a katana. But there's a distinct advantage to using a shinai. When two kendo practitioners use shinai and a set of armor, they can attack each other in a match without worrying about harming the other. Indeed, there are fewer injuries in kendo than any other martial art; most of these injuries result from overpractice rather than any real accident during a match. Kendo allows people to learn to think on their feet and respond to situations with snap judgments. It is also a philosophy of a sort; my sensei always encourages us to be "straight" -- to go straight for our goal without flinching, to continue even though we may have doubts, and to follow through with what we've started. It certainly doesn't sound like a bad philosophy, does it? This is what kendo attempts to create in a practitioner; someone who is both physically and mentally healthy. It creates a person with the judgment and self-confidence necessary to see and opening and go for it despite whatever fears or self-doubt exist. After all, if you're always worrying about getting hit yourself, you'll never be able to get a good hit on the opponent. And hitting is, in the end, what kendo is all about. There are three main striking areas: men (top of the helmet), kote (wrist), and dou (ribcage). There is also a target in front of the throat called tsuki, which is an illegal strike for younger participants and often restricted to higher-ranked and more-experienced practitioners due to the obvious dangers. But it's not as simple as simply hitting the target! Unlike fencing, there are a number of restrictions on what is considered a valid strike, which is why a kendo match requires not one machine, but three experienced human beings in a triangle around two people in a match. These three people carefully watch both of the participants in order to judge who has made a proper strike. Ki-ken-tai-icchi is the Japanese phrase used to explain what constitutes a valid strike. Taken literally, it means "spirit, sword, and body united". To create a valid strike, a kendo practitioner must shout the name of the target (demonstrating spirit and situational awareness), strike the target with his shinai (the sword hitting the target), and stomp forcibly with the right foot while maintaining forward movement (awareness and use of the body in maintaining balance and striking power). He must do all of these at roughly the same time in order to receive a point. It's pretty complex and not at all like real sword-fighting, but it keeps the sport (and it is a sport) from devolving into a series of wild swings and absurd dancing. The techniques and practices used to build ki-ken-tai-icchi also strengthen the body and spirit. Simply shouting the name of the target constantly while practicing is amazing exercise for the lungs, which in turn increases your endurance. Striking itself requires hand-eye coordination and spatial awareness. The stomp is a part of a semi-leap, which strengthens legs (and strains feet/ankles) and improves balance. All of these things together create very real exercise that strengthens both body and spirit! It's a grueling, expensive sport, and it certainly isn't for everyone. I've never excelled at or even liked normal sports, but I love kendo. However, if you think you may be interested, it's definitely worth a look. What can you stand to lose by looking? If you want to see for yourself what kendo is like, the All United States Kendo Federation is a good place to start. Its dojo listing contains only dojo known to practice proper, safe kendo -- so you don't have to worry about throwing your money into some kind of commercial black belt factory. The kendo world grows all the time, so perhaps there's something in your area. I was wondering when the third post would come up. It's actually a nice coincidence since today's the first day in a while that I'm going to kendo; I've been sick for a while, which has kept me out of the dojo. About "wild swings and absurd dancing": I definitely admire the grace of a predetermined set of movements, or even a whole routine, but one thing that's always stuck in the back of my mind regarding swordfighting is, if somebody comes at you on the street and starts swinging at you wildly and dancing absurdly, how do you defend yourself? How do you defend yourself against someone who moves erratically, in ways that you haven't been trained to anticipate? Granted, I have no doubt in my mind that a skilled practitioner of kendo would be well-equipped to handle a situation like that, but that's always been my main concern. Not, "how can I defend against this kind of strike coming in this specific direction", but "how can I defend against this maniac rushing at me when I don't know how he'll attack?" I'm sure that comes gradually, by specifically learning how to defend against this or that type of strike, over time adding up to a general defense. And I'm sure the whole confidence thing comes into play (although I find it hard to have confidence when a person is coming at me with a weapon - again, something that I imagine improves with practice, as well as being more skilled to begin with). I just want to make it clear that what I've said here is in no way an attack on kendo, which I respect and admire. It's just some things that crossed my mind. That last picture is nice. Well, you don't have to start out good at kendo. A lot of kids who start out are, of course, lacking in the confidence to go for a hit regardless of whether or not they'll be hit; it's something you work on as you do kendo. It's actually refreshing to not have to worry about that kind of thing, to be encouraged not to worry about it. The kind of art that addresses your concern about people in all sorts of situations would probably found in a kobudo (古武道), or old-school art. They're more concerned about situational awareness and actual fighting. Yeah, I guess there would be a difference between something designed for competitive sport like kendo, and the self-defense arts. Though, while practical, I think the latter (at least conceptually) suffer from a lack of grace - the sort that comes from carefully coordinated and determined movements. But, I guess that's more akin to an aesthetic form of dancing than actual fighting. I still think an advanced kendo practitioner would be particularly intimidating in a fight. At the very least, he'd have a lot of practice being "attacked" as well as attacking, even if in predetermined forms, and would likely have all that experience practicing confidence to back him up. Haedong Kumdo has a lot of the grace and visual display in it, I think; check out some videos on youtube. I may be wrong and it might be a different form of kumdo, though -- there are a lot of types that are actually unrelated to kumdo, which is the Korean equivalent of kendo. There's that element, but there's also the fact that we're used to it... while wearing armor and thick clothes. I really can't comment on the viewpoint of a high-ranking person, but most of the ones I've met so far have been more like Zorro than, say, Steven Segal. Now, are we talking about Zorro the masked man who carves a "Z" into things with his sword, or Zorro, the person we mutually know?